DEL MAR — Council members Dwight Worden and Ellie Haviland were appointed Oct. 16 to serve on a newly formed committee with two counterparts from Solana Beach to talk about items of mutual interest to each city, but specifically the Del Mar Resort. “If this transmogrifies into where we discuss beyond the north bluff resort that would be OK, but at least the beginning plan would be that this would be not a permanent ongoing thing,” he said. “It would be an interim, informal group to discuss north bluff issues. “I suspect at the first meeting of the committee we’ll talk a little more about the timing and arrangements and how it’s going to operate,” Worden added. Encinitas-based developers Zephyr Partners and Robert Green Company are in negotiations to buy a 6-acre lot on the southwest corner of the Via de la Valle/Camino del Mar intersection above North Beach, also known as Dog Beach. The plan is to build an oceanfront resort with about 290 hotel rooms and 86 residential units with traditional amenities such as a restaurant and meeting and banquet rooms. A low-cost visitor lodge, with rates regulated by the California Coastal Commission, affordable workforce housing, visitor-serving and public parking and public trails are also proposed. 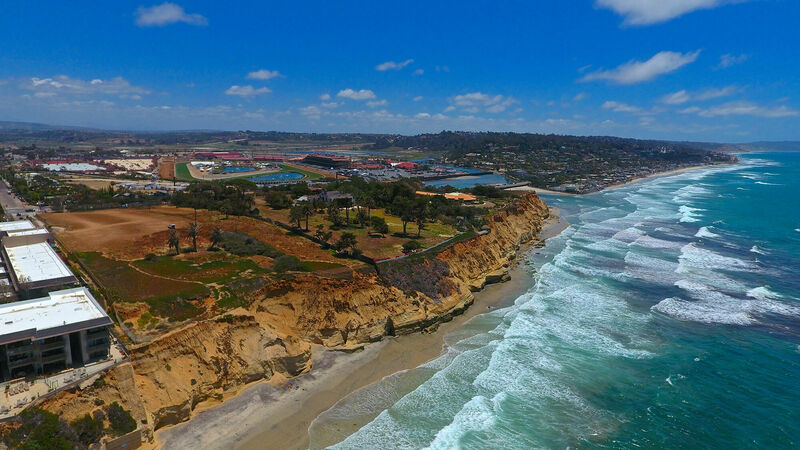 Del Mar will process all necessary permits and legal documents because the resort is within its jurisdiction. But it would not be adjacent to any houses there. The Del Mar Fairgrounds and Brigantine restaurant are across the street to the east and North Beach stands between the proposed project and the closest homes in that city. Solana Beach could potentially be more impacted because the resort would abut residential neighborhoods in the south part of that city. “I think some of us have probably met with some folks on Border (Avenue) and in the Solana Beach neighborhood, and we’ve gotten input from them with their concerns and … forwarded them into our staff process of review, but if this would help in the facilitation of the project I think that would be valuable,” Mayor Terry Sinnott said. Solana Beach Mayor Mike Nichols and Councilman Dave Zito were appointed in September to serve on the committee. Zito suggested the Solana Beach resolution creating the four-person panel should prohibit discussions about the Del Mar Fairgrounds since representatives from both cities serve on a community relations committee dedicated to issues concerning the state-owned facility, which is also in Del Mar but impacts Solana Beach. Solana Beach City Attorney Johanna Canlas recommended appointing different members to the new committee to avoid overlapping interests. Del Mar, however, chose to appoint the two council members who serve on the fairgrounds community relations committee.